A new kind of CDC, the Centers for Health Expansion (CHE), was developed as a strategic healthcare firewall, ready to respond to disease threats instantly. Beyond today’s CDC, which operates physically out of Atlanta, Georgia, the CHE is always on, with digital presences everywhere, ready to provide universal threat awareness, analysis and strategic protection from potential health crises. Ebola mutates like other viruses. In fact, by 2014 there were already four variants of the Ebola virus, with genetic divergences as great as 45 percent. 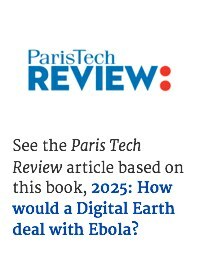 In 2025 a fifth variant of Ebola appeared. Immune to all vaccines, it was as contagious and deadly as a media headline writer’s dreams. Without warning, the CHE’s newest unexpected challenge had arrived. To Nurse Kate Sweeney, an intake nurse at the University of Wisconsin Student Health Center in Madison, Wisconsin, it was just another busy day until Kani Imara arrived. Kani was a young African man, running a high fever and vomiting, obviously in severe pain. Alarmed, Nurse Sweeney called in Dr. Diane Mayhew, the senior doctor on duty. Dr. Mayhew learned that Kani had recently arrived from Africa and was acutely ill.
Dr. Mayhew turned to the examining room’s wall screen and Focused the clinic’s Immediate Response Shared Space, which provided instantly available resources. She Activated its continuous connection to the CHE’s “First Response Team” in Atlanta, Georgia. Susan Leck, a CHE medical threat assessment specialist, instantly appeared live on the wall screen in the examination room at the University of Wisconsin’s Student Health Center. Ms. Leck was life-size in a simulated 3-D parallax view, looking like she sat in the same room with them, separated by only a sheet of glass. Her name, title and location was displayed next to her head by the Shared Space‘s recognition system, as was Dr. Mayhew‘s next to her image in front of Ms. Leck. Recognition was immediate because this used the Shared Spaces’ short list of members, with access to each person’s biometric profile. As the United States’ healthcare firewall, by 2025 the CHE was leading the building of a DMI, a Digital Medical Infrastructure. Its “Shared Planetary Life Spaces” provided continuous connections to related groups of people, places, systems, services, online tools, data and other resources. They all remained Inactive while connected. A Presence System maintained readiness to Activate any of them instantly when needed. A “First Responder” Shared Space provides an emergency services entrance to address unexpected medical threats and bio-terror attacks. The CHE ran multiple Shared Spaces for first responders, infectious diseases, chronic conditions, infection control, strategic medical supplies and more. Because anyone and anything could be immediately added from one Shared Space to another, it was as if the CHE had turned the nation’s medical infrastructure into a universal digital resource, both focused and able to deliver all its digital services instantly in real-time, everywhere. In the big picture, today’s digital child was maturing. A new kind of Digital Earth platform gave every organization and person the world’s combined abilities at their fingertips. During use Active Knowledge protocols were auto-displayed so everyone always knew how to rise to the top. Shared Spaces added continuous connections so people and organizations worked together instantly. New opportunities for greatness were everywhere, a new norm for everyone’s life. Today’s digital child was maturing. People and organizations worked together instantly in Shared Spaces. A new kind of Digital Earth platform put the world’s combined abilities at everyone’s fingertips. Dr. Mayhew quickly updated the CHE’s Ms. Leck. She checked the CHE’s Active Knowledge protocol for this first response, learning Kani had just arrived from Liberia to start classes at the University of Wisconsin the following week. Kani had been rescued as a young teen from child labor on a cocoa plantation in Cote d‘lvoire, smuggled into Liberia and educated in a farming community, where he grew into a local leader who helped stop child trafficking and forced labor on cocoa plantations. After he attended several international conferences as a speaker, a Swiss-based child trafficking organization hired him for their Monrovia office. Now they were sending him to the University of Wisconsin for a year of training in an international leadership development program on human rights. Suddenly that wasn’t as important as saving Kani’s life. Ms. Leck told Dr. Mayhew a new mutated strain of Ebola had developed in Liberia, and it was resistant to the Ebola vaccine developed in 2015. Since this might be its first case in the United States, she immediately displayed the CHE‘s Active Knowledge protocol for resistant Ebola, so they could start applying it. Ms. Leck Focused the CHE’s Infectious Diseases Shared Space. She Activated its top Ebola epidemiologist, told him there was an emergency, and added him to the “First Response” Shared Space. She introduced Dr. Richard Chester, in Boston, at Harvard Medical School. Dr. Chester was studying the new resistant Ebola strain in Liberia using both personal visits and digital presence in Medical Treatment Shared Spaces. Each Shared Space provides one focused set of people and resources. Multiple Shared Spaces can be used as a single large network of constantly connected, immediately available resources. Dr. Mayhew blended Kani Imara’s medical record into the Shared Space background. When Dr. Chester sat down in front of his PC he was recognized and his digital environment restored. Because the First Responder Shared Space was on his tablet when he put it down, the same Shared Space was displayed automatically on his PC screen, with Kani’s medical records blended into its background. In Madison, Wisconsin, Dr. Chester’s new PC-acquired image was displayed at Kani Imara’s medical examination. He took over and guided the medical examination of Kani Imara. He recognized the symptoms and told them this was probably the new strain of Ebola. He said the patient needs an IV to replenish lost fluids first. Ms. Leck immediately Activated two more “First Responder” specialists while Dr. Mayhew Activated Suresh Sharma, the clinic’s administrator. He looked over the exam room, saw the patient resting after vomiting, and the CHE participants on screen with their names and titles next to each of them. “We’ll get the patient and your clinic through this,” Dr. Chester said. On the screen each person’s names and information floated next to their live images. It showed Ms. Leck was in Atlanta, Dr. Chester in Boston, Tom in Philadelphia, Li in San Diego and Suresh Sharma using a tablet near a nurse’s station in the Madison, Wisconsin clinic. When a situation is complicated and no one knows how to handle it, specialists and experts can be brought in immediately to add guidance. Each person’s live video was blended into an on-screen group which auto-sized and lit everyone so it looked as if they were meeting in a single room. They muted their audio to this main group and started working together individually, hearing the audio from just the person they worked with. Tom helped Suresh get them the best available PPE immediately, then he turned to Dr. Mayhew and Nurse Sweeney and helped them put it on correctly. Next, Dr. Chester took over and guided the treatment and medical examination of Kani Imara. They were triple gloved so he put on triple gloves and took time to show Dr. Mayhew and Nurse Sweeney the best technique to find a vein, draw blood and start an IV — without sticking themselves with a needle. With his guidance they safely obtained blood samples to do a DNA analysis of this strain of Ebola, to learn more about this new vaccine resistant strain. Simultaneously, Li Min helped the clinic focus on infection control. They captured personal contact information from all the patients there, their friends with them, and staff, then evacuated the clinic. Then he organized the staff in sanitizing the university’s student health center, so it could reopen as soon as possible. Ms. Leck also Focused the CHE Protocol Improvement Shared Space, and Activated Jim Hutton who was in Atlanta at the CHE’s headquarters. She added Jim as an observer, so that team could immediately see the current Ebola discovery protocol during use. All CHE “First Response” sessions were recorded, so he had a complete record of the steps followed and the patient‘s condition. If a better procedure was possible, Protocol Improvement would update that Active Knowledge protocol so the next Ebola incident would apply the best steps. Then she Activated a CHE Communications specialist, Lisa Gerber in Washington, DC. 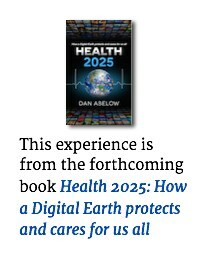 In 2025 the arrival of Ebola and the evacuation of the University of Wisconsin’s Student Health Center would spark an immediate surge of online attention on Ebola, the people present at its discovery, and every step the CHE took to handle it. These would be Lisa’s focus, and she had the CHE Shared Spaces, team and event recording to handle the coming torrent. An entire team can be rapidly assembled from multiple Shared Spaces. While they all work on one problem they can divide into several smaller teams that each handle part of the problem at the same time. Get the insights you need to take advantage of a Digital Earth by signing up for our weekly Future Letter. Immediately receive a free copy of the book Imagine a New Future: Creating Greatness for All. 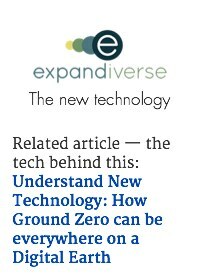 Share the post "Experience 2: Ground zero is everywhere: Immediate expert diagnosis anywhere, anytime"